Depending on the type of survey undertaken, an ability to understand the specific principles to set-up and help process field data. It could be that different techniques are used on the same site, each providing a layer of data to interpret. Even if you do not intend to become a specialist in this field, understanding the relevant and appropriate techniques will be useful. Novice – Is able to participate in the process of data collection, but would not be able to set up, survey and process data without full supervision. Competent – Depending on the Geophysical survey technique used, the individual can assist in all aspects of the process, but may need some supervision. Proficient – Can confidently assist in a geophysical survey without prompting for the correct procedures. Always locate your survey grid. Gradiometer survey (also known as magnetometry or magnetic gradient survey) is a passive geophysical method that detects local variation in the strength of the earth’s magnetic field. Resistance tomography survey is a geophysical technique for imaging sub-surface structures from electrical resistivity measurements made at the surface. Magnetic susceptibility survey; Every kind of material has unique magnetic properties, even those that we do not think of as being “magnetic”. Different materials below the ground can cause local disturbances in the Earth’s magnetic field that are detectable with sensitive magnetometers. The chief limitation of magnetometer survey is that subtle features of interest may be obscured by highly magnetic geologic or modern materials. Ground penetrating radar survey is a geophysical method that uses radar pulses to image the subsurface. This nondestructive method uses electromagnetic radiation in the microwave band (UHF/VHF frequencies) of the radio spectrum, and detects the reflected signals from subsurface structures. GPR can be used in a variety of media, including rock, loose soil, floors and structures. It can detect objects, changes in material, and voids. 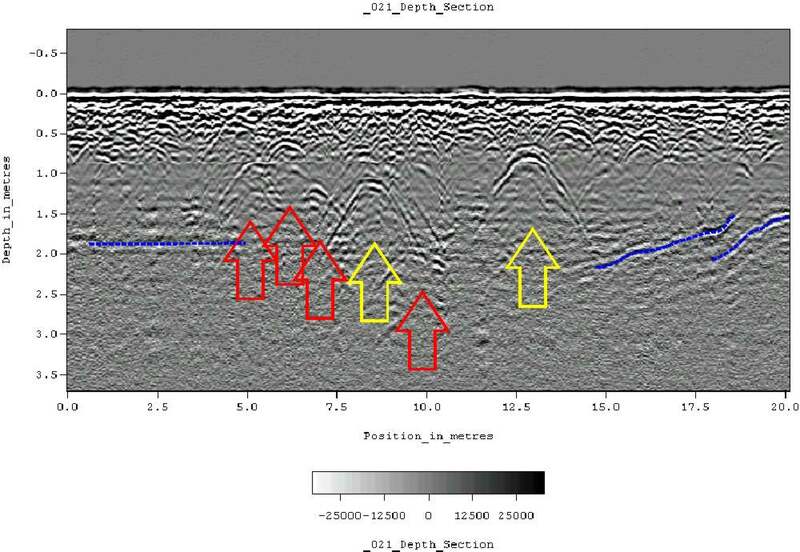 A ground-penetrating radargram collected on a historic cemetery in Alabama, USA. Hyperbolic reflections indicate the presence of reflectors buried beneath the surface, possibly associated with human burials. 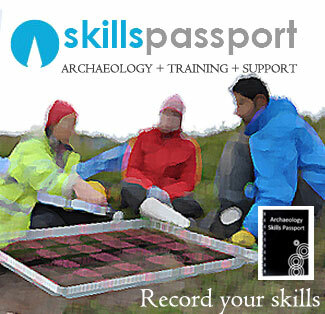 2000 Seeing Beneath the Soil: Prospection Methods in Archaeology. Reprint of 1990 edition. B.T. Batsford, London.